1) What is the concept of wellbeing? 2) How can we assess it in a workplace environment via worker self-report? 3) How do individual differences (especially personality traits) impact worker perceptions of wellbeing? 4) To what extent can perceived choice (and control) over one’s environment be a strategy to improve work wellbeing? 5) How does personality type impact this strategy? 6) What elements and specific strategies of workplace design improve employee happiness with choice and control in their workplace? “Work” is an increasingly dynamic activity and environment. Research into individual personality and organizational culture is just beginning to add additional layers to this intersection of business and design. While much discussion has occurred in and around these topics, there is a dire lack of consistent definitions and rigorous approaches to empirically measure these concepts within various industries. There is a need for focused application of evidenced-based insights towards designing health workplaces that promote work wellbeing. We developed a survey tool was developed based on existing, validated tools from psychology (TIPI, the Big Five) as well as an extensive literature review. The questions naire focused on measures of wellbeing, perceptions of choice and control, and personality. Our respondents included 572 panel participants (self-reported full-time knowledge-workers working in the office at least 3 days per week) which were asked basic demographic questions as well as the location of office, position, hours worked, type of office and type of industry and company size. Levels of extraversion/introversion significantly predicted life and job satisfaction, organizational commitment and ability to focus. Additionally, extraversion/introversion and emotion stability were significant predictors of both self-reported physical and mental health. This empirically supports that workplaces should take into account individual personalities in how they are designed. Choice and control are perceived as interdependent variables in the workplace (i.e., you cannot have choice without first having control). This suggests that awareness, perceived accessibility and permission are critical parts of workplace design that should be considered as part of design solutions. We worked with design professionals to outline core principles for designing for choice and control, that is inclusive to all personality types. – the following are actionable insights and actionable implications for design. were considered for the key take-aways from the findings. To design for personality: Complete a Big 5 Personality Study before determining future workplace scenarios based on the general personality profile of your organization. This can be a part of retaining current talent or recruiting a new type of talent for your company. To design for choice and control: Clearly communicate elements of control (e.g., the ability to select, adjust, rearrange) within the environment that may need to be supported by leadership behavior and/or education. The perceived concept of choice is dependent on secondary elements of design like policy, program and culture. Providing (healthy) choices and control can ultimately translate to improved physical and mental health. 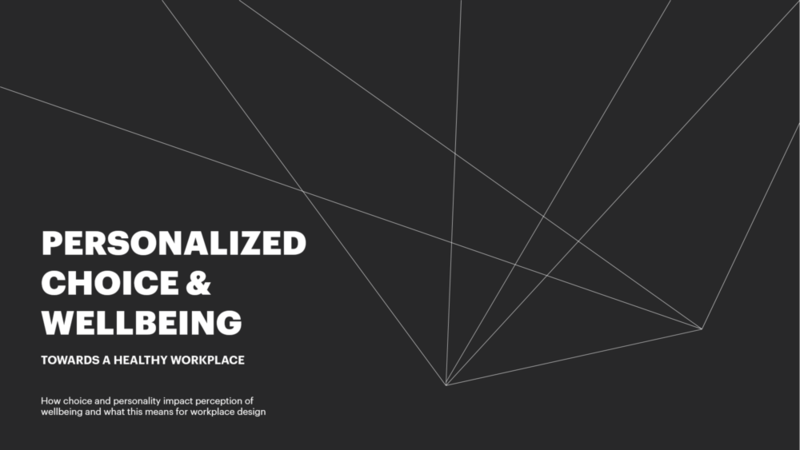 To design for personalization- not just in space: Generate an appropriate allocation of different work spaces to reflect appropriate modalities of work in your organization workers may need to engage in. Again, make these visible and accessible so there is a perception of choice and control. For example, make hoteling stations make schedules transparent and provide some choice over lighting, and control over individual work spaces to foster a sense of so they can have ownership. Integration of this study into the HKS Living Labs effort has enabled us to continue to collect personality data, perceptions of wellbeing and reported satisfaction with environmental elements of the workplace. Begin to define specific, quantitative measures of ‘wellbeing’ through environmental sensors (e.g., temperature, light, sound, air quality).